The Chocolate Kiss Cafe and Why I Love It! The UP campus isn’t exactly the place to go to when your stomach starts to whine for gastronomic delights. It’s definitely home to the best fishballs in the metro but you kinda won’t go out of your way to eat there. Or so I thought… Roughly about ten years ago, I heard from a classmate in UP graduate school that there was this quaint reastaurant called The Chocolate Kiss Cafe right in the heart of the campus that served really good food. She continued to say that people from all over the town drove all the way to the resto just to taste their food. And hey, that was enough reason for me to jump into the bandwagon! The day I tasted their chicken hainanese, I never stopped craving for more of their food choices. I swear by it, really. Actually, every viand on their menu simply just literally melted in my mouth! Their topsellers include chicken ala kiev and the hickory smoked baby back ribs. 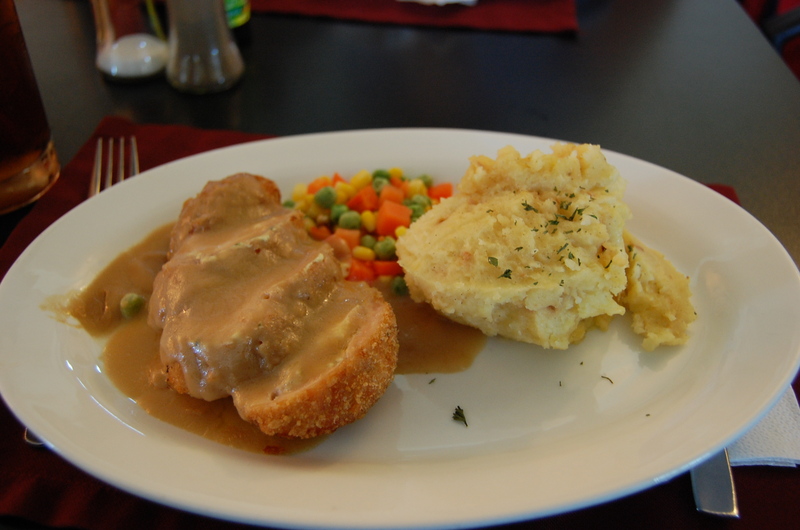 The ala kiev is served with creamy mashed potatoes. It’s the most savory ala kiev I know. The butter filling inside the chicken log has the right consistency enough to keep the meat moist while you’re sampling it. Just a tip–I think the technique there is to freeze the butter first before you fill it in to the chicken log. So when you fry the chicken, the butter does not melt away long before the meat is cooked. The mashed potato is definitely the perfect partner for this dish, hands down. 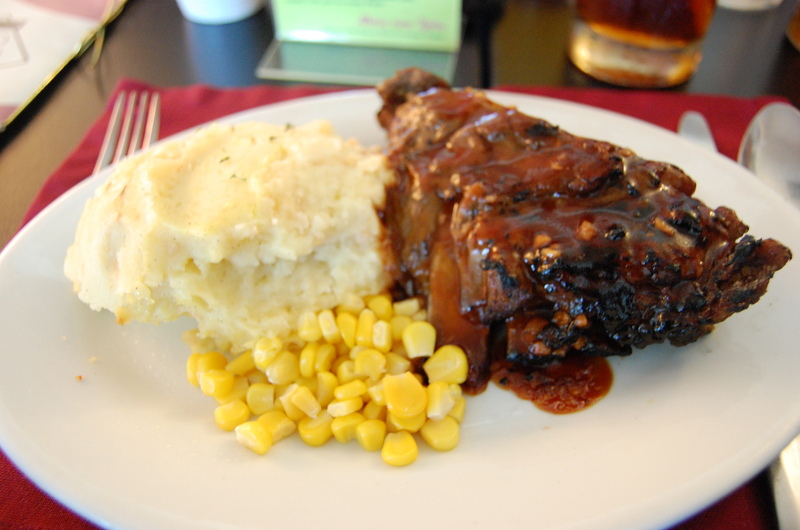 The hickory smoked baby back ribs is another to die for specialty of The Chocolate kiss cafe. It’s the fall-off-the-bones kind with the hickory smoked flavor. The rich, succulent, sweet n spicy hickory sauce just coats the ribs so perfectly. The charred texture is reminiscent of a typical texan bbq, backyard-grilled-style. It simply blows me away! The other must try dishes would be their chicken in the basket, hungarian sausage penne pasta and of course their chicken hainanese! Save the best for last. You can’t leave the place without trying their famous cakes. I highly recommend the dayap cake and the sansrival! Expect to savor on your palate the bursting sweet taste of these cakes long before you have left the cafe. Two thumbs up for you, guys! ** The Chocolate Kiss Cafe is located at the UP Campus in Diliman, Quezon City (2nd flr Bahay ng Alumni) with another branch at #91 A. Roces Avenue Corner Sct. Tobias Street Quezon City, Quezon City, tel #4127876.